"Myths rely on truth for their power. If The Lord of the Rings is powerful, it is because it honestly portrays the struggles of man." Few films have been as hotly anticipated as the finale to Peter Jackson's immense, sprawling adaptation of Tolkien's Lord of the Rings. This disc provides some interesting historical parallels to the story and its characters, some of which are striking and others of which seem more filler than anything, primarily designed to separate dollars from the film's fans. Narrator John Rhys-Davies describes a series of historical antecedents to Tolkien's characters, through the use of interviews, reenactments and film clips. Much emphasis is given to Aragorn, the title character of Return of the King. His reluctance to seek the throne (a characteristic hotly contested by Tolkien purists) is compared to William Wallace of Braveheart fame, sacrificing everything for the ideal of freedom. Aragorn is also painted as a variant on Queen Elizabeth I, putting her duty to her country ahead of her own love and marriage. Simillarly, Churchill's inspiration of Britain during the Second World War is connected with Aragorn's rallying of the troops of Gondor, while the defense of Helm's Deep is seen in the light of Henry V's battle at Agincourt (though Aragorn of course has no secret weapon comparable to Henry's longbowmen). More of a stretch are the comparison of Gandalf, the wise counselor, to William Cecil, secretary to Elizabeth I and to Benjamin Franklin. On the evil counselor side, Grima Wormtongue is viewed in the light of Rasputin's control over the Romanovs. Faramir's suicidal attack on Osgiliath is somewhat perfunctorily related to Pickett's Charge at Gettysburg, and a similar short shrift is given to the Lewis and Clark equivalence to Frodo and Sam. More to the point is the odd couple of Edmund Hillary and Tenzing Norgay to Legolas and Gimli, and most striking of all, Matthew Henson, faithful companion to Robert Peary, who like Sam repeatedly saved the supposed leader's life and even ended up carrying him. The reenactments are fairly weak for the most part, and there's quite a bit of historian talking heads. It seems a little odd to see these supposed historians holding forth as if they're authorities on Tolkien's epic. But most viewers will be interested primarily in the clips from the picture. 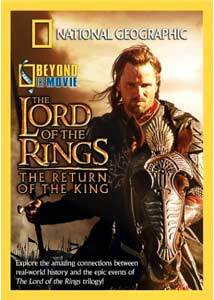 Unfortunately, despite the title there's little from Return of the King here; most of the clips are from the first two films. Beyond brief snippets, there are seven segments from the picture, two of which have been cut from the theatrical edition. Aragorn and Theoden survey the troops, Frodo and Sam have a brief conversation a glimpse of the reforging of Narsil is seen, and Gandalf addresses Denethor. Aragorn is seen doing his Henry V impression as he inspires the army before the Black Gates of Morannon, while wearing the armor of the White Tree of Gondor. A short chunk of Legolas and Gimli's drinking game, cut from the final film, is present as is a scene briefly glimpsed in the trailer (and somewhat longer here) but scissored from the theatrical release, as Merry pledges fealty to Theoden. In all, there's probably less than two minutes of footage from the third film here, making this an inevitable disappointment for those seeking a sneak peek. The running time is over 8 minutes shorter even than the 60 minutes claimed on the snapper case, though it also indicates that the program is longer than the version that was aired on television. I have no idea what has been added and no indication is given here. On the positive side, marked packages contain a $5.00 coupon towards an admission to the movie (valid through January 17, 2004), making it a slightly better value for early purchasers. Image Transfer Review: The program is presented in full frame as originally aired. The segments from the movies are in nonanamorphic widescreen, but they have been cropped somewhat to result in about a 2.0:1 ratio rather than the proper 2.35:1. Color and detail are generally quite good, though a few film clips are of rather poor quality. Some photos have substantial aliasing but for the most part the picture is rather attractive. Audio Transfer Review: The audio here is a 2.0 Surround, and while it can't compare to the 5.1 tracks of the films proper, it's decent, without noticeable noise or hiss. Music has a good presence with substantial surround activity though little in the way of perceptible directionality. Bass is good for Dolby Surround. Extras Review: The extra materials are pretty sparse. Fourteen photos from the film and of the historic personages are included, as is a quiz of eight questions of varying difficulty relating to the books, the films, and the author. The balance of the disc is filled up with numerous ads for other discs, www.nationalgeographic.com and the National Geographic Channel, which I don't count as being extras. A somewhat disappointing history lesson in Lord of the Rings trappings, with a few new bits of footage and some inconsequential extras. The transfer's not bad, although the film segments are cropped slightly.